The Math Study Skills program helps students deal with a variety of course-related issues, including how to reduce math anxiety, how to improve homework and study techniques, how to become a better listener and note-taker, how to remember what is learned, and how to improve math test-taking skills. The Math Study Skills program can help all students become more effective math students. Calculus 3 utilizes previously learned techniques to solve problems in 3-dimentional space. Vectors are studied extensively, as well as surfaces, gradients, velocity, acceleration, and many other wonderful topics. Calculus 2 topics expand the skills in calculating derivatives and integrals, and applies those skills in a variety of application situations. 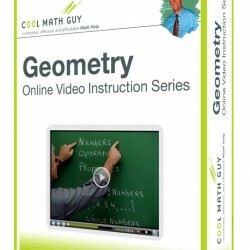 Topics include sequences and series, conics, parametric equations, and polar coordinates. The graphing calculator is used extensively. 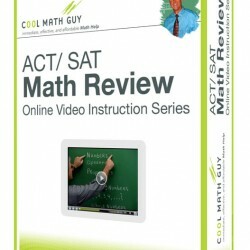 The math review program contains over 15 hours of information designed to prepare students for the ACT or SAT standardized tests by (1) reviewing content contained on the tests and (2) working many problems written in the style of standardized tests. Emphasis is on test-taking strategies (much different from classroom strategies) to save time and reduce test anxiety. See the table of contents for more specific topic information. 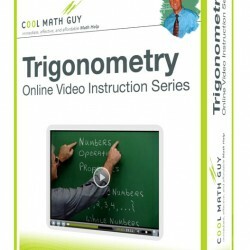 Following a review of foundational algebra topics (primarily functions and the related topics of graphs, transformations, combinations, and inverses) the great power of Trigonometry in a “mathematical toolbox” is unveiled as the course continues into degree and radian measure, trig ratios, graphs of trig functions, trigonometric identities and equations, and vectors. Exponential and logarithmic functions are included, along with the study of conics, parametric equations, and polar coordinates. Use of the graphing calculator is emphasized. Topics in Statistics include the study of various “averages” and standard deviation and extend into probability, various sampling distributions, estimating using confidence intervals, and hypothesis testing. Special emphasis is given to real world applications. The graphing calculator is used extensively. Topics in Precalculus extend concepts learned in Algebra II and also include all topics contained in a typical trigonometry course as well as conic sections, significant use of the graphing calculator, polar coordinates, vectors, geometry in three dimensions, limits, and an introduction to calculus. Prealgebra is the combination of elements from Arithmetic and Algebra I. Arithmetic topics are treated as review items while Algebra I topics are introduced more deliberately than in Algebra I. Prealgebra is typically taken in 6th or 7th grade and is often used as a developmental course at the college level. Topics include definitions, postulates, theorems, two-column proofs (mostly involving parallel lines and triangles), quadrilaterals, other polygons, circles, basic constructions, perimeter, area, solids, volume, surface area, analytic geometry and the basic trigonometric ratios. Topics include the study of functions extends to higher degree functions, transformations of graphs, and inverse functions. The study of quadratic functions in Algebra II extends to polynomial functions of higher degree and transformations of graphs. The study of matrices extends to operations with matrices and applications. Exponential and logarithmic functions as well as the study of conics are included. Use of the graphing calculator is emphasized. Topics include the four fundamental operations of addition, subtraction, multiplication, and division of (1) whole numbers, (2) fractions, and (3) decimals. Topics in Algebra 2 primarily extend concepts learned in Algebra I and also include functions, complex numbers, exponential and logarithmic functions, use of the graphing calculator, matrices, conics, sequences and series. In Calculus I, the student primarily learns the meaning and interpretation of derivative and integration, the two concepts that are the foundations of subsequent calculus courses. Also included is the study of differential equations. The graphing calculator is used extensively. Topics include solving linear equations and inequalities, graphing equations and inequalities with some use of the graphing calculator, exponents, polynomials, factoring, rational expressions and equations, systems of linear equations and inequalities, radical expressions and equations, and solving quadratic equations.